14KT pricing FROM $58.00 per gram . Available in 7", 8", 16", 18", 20", 24" and 30" and various weights and thickness. Please note: While 14kt white gold and platinum chains are available, the link styles and widths are limited. We pride ourselves on providing personalized customer service so don't hesitate to call 1-888-727-8266, 9am - 5pm EST or email for a quote . Prices subject to change without notice - please call for a quote. Other widths may be available. ONLY the Handmade anchor chain is available in 14kt White. 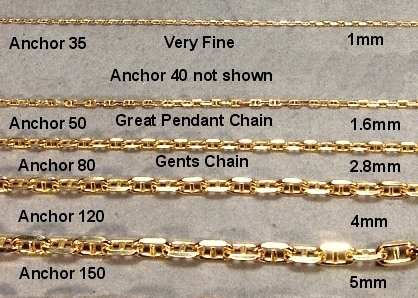 Photo of all our Anchor link chains together. "Consto" link (Latin) - Letters which translate to "Forever"